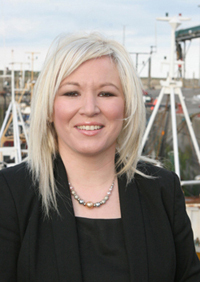 Responding to a debate on challenges facing the fishing fleet in Portavogie, Fisheries Minister Michelle O’Neill has outlined a package of measures that will assist the industry to respond to the challenges ahead. Minister O’Neill said: “I recognise that the industry is going through a challenging period and that more changes will arise as a result of the new Common Fisheries policy. I have therefore recently announced a package of financial measures that will assist the fishing industry to respond to the challenges ahead. Northern Ireland Agriculture MInister Minister Michele O’Neill explains the support from DARD to the fishing sector. “Financial resources will be made available through the European Fisheries Fund to include the establishment of a ‘research and development fund’ specifically to develop fishing gear with very low catch rates of unwanted fish. We will need to discuss the details of this with the industry but it is anticipated that over the next two years some £200,000 of support will be available for adoption of highly selective devices and around three hundred thousand pounds of support will be available towards a complete change of fishing gear. “In addition further financial assistance will be provided to the industry to review and improve skills and safety within the fleet. The Minister said she understood the frustration of the fishing fleet in Portavogie that has had to cope with a period of rapid change at the end of 2012 and bad weather at the start of 2013. She added: “Poor weather in March and April did have a dramatic effect on landings, however landings in January, February and May were more typical. For the year to the end of May landings of prawns by our fleet into Portavogie were down 22% overall compared to the five year average for this stage of the year.